Finally, motorcycle owners can buy a cover with a fabric that provides maximum protection, but isn't bulky and hard to store. 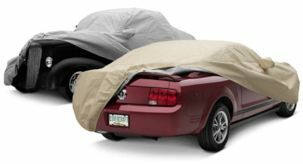 Full covers protect the bike from sun and rain, dust, dirt, bird and tree droppings, as well as pollutants in the air. They're available in both our Deluxe semi-custom sizes and the custom-patterned program for Harley-Davidson® models. Due to the unique construction of the fabric, they don't need liners or vents or even heat shields (but the bike does need to cool down for about 3 to 5 minutes before you install the cover). This is the cover you've been waiting for - check out the features below and you'll agree - there's never been a fabric this good! Fade resistant - Means color goes all the way through fibers.